FILE - People watch a news broadcast on a missile launch in Pyongyang, North Korea, July 29, 2017. North Korean leader Kim Jong Un said the second flight test of an intercontinental ballistic missile demonstrated his country could hit the U.S. mainland. Foreign-funded education institutions are scaling back their activities in Pyongyang as more and more governments issue travel warnings on North Korea after its nuclear and missile threats. “The British Council suspended the English language teaching program in Pyongyang when the travel advice from the U.K. government changed,” a spokesperson for the London-based council said in an email to VOA’s Korean Service Wednesday. Discussions the council was having about extending its program in North Korea were also put on hold, they added. In keeping with the British government’s policy of “critical engagement” with North Korea, which emphasizes reducing the chasm between the isolated country and the international community through educational and cultural exchanges, the British Council has been running the English Language Teacher Training Program (ELT program) since May 2000, when the U.K. and the North first established diplomatic relations. Since then, the council has taught more than 4,000 English teachers in Pyongyang. Four teachers covered the suspended programs. The council’s decision complies with the British foreign office’s recent upgrade of its travel alert for North Korea following Pyongyang’s long-range missile tests and sixth nuclear test. On Sunday, the Kim Jong Un regime announced on state media that it had detonated a thermonuclear weapon that can fit atop an intercontinental ballistic missile (ICBM). 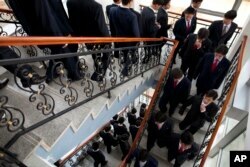 FILE - This Oct. 5, 2011, photo shows students at Pyongyang University of Science and Technology. Earlier Monday, Pyongyang University of Science and Technology (PUST) released a statement announcing the start of the fall semester. It said the initial arrangements for classes had been “adapted to suit the available resources” wording that reflects a U.S. travel ban that took effect Sept. 1. The university’s activities however seem to have been significantly restricted. A professor at PUST’s College of Dentistry, who asked to remain anonymous, told VOA Korean that dental classes will be offered only by North Korean faculty members this fall because of the recent U.S. measure, which is affecting not only American citizens, but other foreign nationals. An unnamed PUST employee in the College of Business, who is British, said he would not be in Pyongyang this fall as his aid agency, which coordinates his teaching trips to Pyongyang, decided not to send any personnel to the school. The U.S. State Department introduced the travel ban in July amid growing concerns over “the serious risk of arrest and long-term detention” to American nationals traveling to and within North Korea. The ban currently gives exceptions to individuals seeking to travel to the North for certain limited humanitarian or other purposes, though they require special approval.